A former chancellor has claimed an independent Scotland that kept the pound would later rejoin the UK. Alistair Darling said a currency union after independence would "sooner or later" turn into economic and then political union. First Minister Alex Salmond has previously argued that Scotland would be part of a "sterling zone" with the rest of Britain after independence. 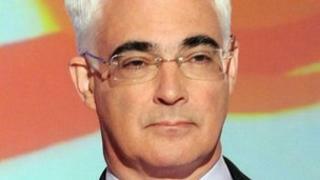 The SNP said Mr Darling was "unable to make any positive case for the Union." Mr Darling, the Labour MP for Edinburgh South West, is chairman of the pro-Union Better Together campaign ahead of the referendum on Scottish independence in 2014. Speaking as he delivered this year's John P Mackintosh Memorial Lecture in Prestonpans, East Lothian, on Friday evening, he said the "most obvious problem" with a common currency was that "sooner or later it takes you to economic and then political union." He added: "So Scotland would leave the UK only to end up in the same place as it began, with all the trauma that would entail. "And worse than that, a common currency union comes with massive strings attached. A pact that would bind both parties into tightly defined constraints. "If the purpose of independence is freedom for manoeuvre, to go your own way, why then hand back the levers of economic policy to your bigger next door neighbour which would by then be a foreign country. It is a nonsense. "Today we are equal partners in the United Kingdom. With independence Scotland's budget would have to be approved beyond the border. That's not freedom. That's not independence. That's serfdom." A spokesman for Deputy First Minister Nicola Sturgeon said: "It is telling that Alistair Darling is unable to make any positive case, and instead just attacks Scotland's prospects. "His contradictory claims are not even supported by the facts. Dozens of countries have become independent from Westminster since 1945, and none have chosen to return to London rule. "The contrast is clear between the Scottish government setting out the practical ways that Scotland can use the financial powers of independence to boost growth and jobs, and Alistair Darling's threadbare case for an outdated Union. "The bottom line is that Scotland will be better off with independence and control of our own resources."